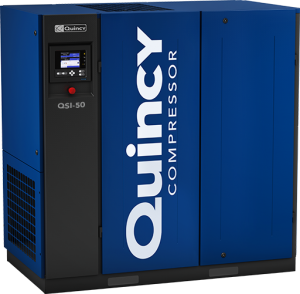 Quincy Compressor QSI industrial duty direct drive air compressors optimize compressor ownership in order to provide you with the best ROI in the market. A Quincy direct drive air compressor is an investment in the long-term success and profitability of your business. We strive to deliver products that last longer and provide more reliable performance throughout their operational life. Quincy QSI air compressors are engineered to provide upwards of 100,000 hours of service — more than double the expected lifespan of its lower-cost competitors. In addition to lasting longer, our products also have fewer maintenance requirements and increased average uptime. These key benefits translate to a faster return on your investment as well as greater productivity overall. In industries where overheads are high and maximum productivity is key, the ability to precisely control your air compressor is a vital part of staying profitable. Quincy direct drive air compressors feature multiple control options that allow you to maintain optimal efficiency without sacrificing performance. The QSI series is equipped with a microprocessor-based control system. An intuitive navigation menu makes it easy to make fine-tuned adjustments to system performance, without having to memorize codes or navigate complex parameters. Optional gauge controls further refine this functionality. Simple, reliable and easy to read, Quincy gauge control systems feature silicone-dampened movements for precise adjustments of pressure, capacity and temperature. At Quincy, we know work can’t stop for regular maintenance to your important equipment. We have designed our direct drive air compressors to have minimal service requirements to reduce downtime. Quincy QSI air compressors feature a high performance filter that keeps your purchase running cleanly and efficiently for longer. At the heart of large-range Quincy direct drive air compressors is an efficient, low-noise cooling fan with a replaceable module. Easier access to serviceable components means that, when maintenance is required, the process is quick. For more information, download the product manual or visit our Resources page to learn about basic maintenance procedures that can be done by your team. When it comes to Quincy direct drive air compressors, high performance, long life and low service requirements aren’t just part of a sales pitch. They’re things we actively stand behind with one of the best warranty programs in the business. All QSI compressors are backed by our Royal Blue warranty program, covering the unit’s airend for 10 years and other major components for five. With Quincy, you can be confident knowing you’re doing business with a company that is there for you for as long as you own our products. Extended warranty and maintenance packages are also available — contact a representative for more information. A Quincy QSI air compressor is a key part of an overall air quality solution. Pair any product in the QSI line with an inline filter and refrigerated drier for a complete integrated system that is compliant with ISO 8573.1.1.4.1 standards. Let one of our expert sales representatives put together a package that works for your organization. Questions? 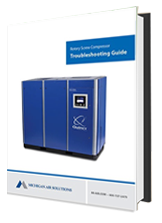 Contact us for more information and advice on selecting and maintaining your rotary compressor. Run more efficiently with this quick reference guide that covers common issues. Still have questions? Contacts Us, we’re here to help.